Did you already wonder how you could improve your performance without having to go to the gym or run for miles and miles everyday? On court fitness training is one of the best training method that can help you to improve the specific skills of your activity. To describe more in details this kind of training we will talk about on court fitness training for tennis players. On court fitness training includes all the different practices that are done on a tennis court. Most on the time on court fitness training is done to improve the agility, quickness and specific movements of the players. Training on the tennis court helps the players to be really specific and to understand exactly how these drills could help them to become better tennis players. There are so many different kind of practice you can run on court to increase a player fitness level that you can just use your imagination and make sure that the drills you are implementing are tennis specific. First of all use tennis racquets in most of the case to add some specificity. You can start by doing the drill without any tennis balls. Run to a cone as if you were going to hit a forehand or a backhand, shadow the stroke and come back to the starting point. 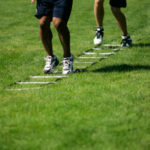 When you do these kinds of specific movements, make sure that you are using an explosive first step that you are balanced all the time and use proper technique when you recover like using a cross over step and the side steps. This basic drill can be used for all the strokes, included the volleys and overheads. Repeat several sets of 10 repetitions for each stroke. Make sure your player or your self is really using the right technique in his footwork and that he is as intense and fast as he can. This will help to improve the explosive power and quickness very fast. For more advanced players you can start to add resistance as bunjie cords behind the players. Repeat different kind of movements, focusing on the right technique and the resistance will help to become even more explosive on the court. Once the players are able to do this drills with the right footwork, do not forget first step and recovery steps are two keys for tennis players, you can start to add live balls that you feed at th e same spot every time.. This can be done with or without resistance. The player focus on his movements and the fact that he now has to hit a tennis ball will add even more specificity. Once the player is able to use the proper technique and to be quick during this kind of drills with live balls, he will move a lot better and be a lot quicker during real match situations. Another great workout that I like to use as on court fitness training is medicine ball rallies. Have two players playing point in the service boxes with a 4 to 8 lbs medicine ball. Make sure this medicine ball bounce and make them play different tie breakers, using forehand and backhand throws. This will of course help them to improve their upper body power but also their footwork and balance on the court. You can also improve their aerobic capacity with on court fitness training, while moving for the length of a point, usually less than 10 seconds, and recovering between each set for 25 seconds. Those ratios are specific for tennis and if you do this for at least 20 minutes it is a good way to improve your players specific endurance. On court fitness training is the best practice you can do to improve a tennis player specific conditioning. There a lot of different drills that you could use. Fit4tennis could help you to find the right fitness program for tennis.